Volume 16, Issue 7, December 2015.
training in the use of personal protective equipment (PPE). a healthcare worker at risk for exposure to bodily secretions. and may increase length of time to successful intubation. Jessica Wall, MD, MPH, et al. logistic regression to evaluate predictors of DNR status. that DNR orders were not significantly associated with death during admission (p=0.084). presence is not a predictor of death in the hospital. associations between imaging modalities and outcomes. 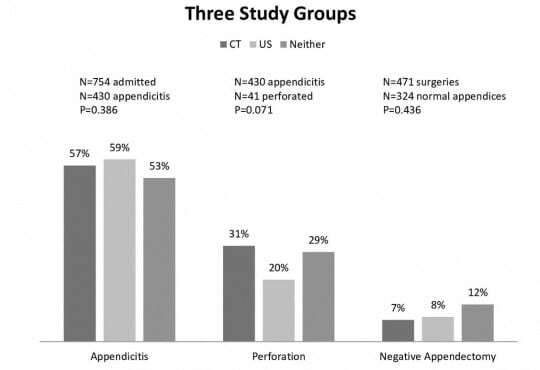 records from 1/1/2009–2/31/2010 and included patients with suspected acute appendicitis. between those with a CT (18%, 95% CI [12.3,23.7]) and those without (13%, 95% CI [10.3,15.7]). [2.1,11.9]), US (8%, 95% CI [4.7,11.3]) and neither (12%, 95% CI [5.9,18.1]). against the current protocols used by the 33 EMS agencies in the state of California. regionalization systems, prehospital fibrinolysis and β-blockers. for their STEMI patients. No agency is currently employing prehospital fibrinolysis or β-blocker use. condition may be useful for EMS medical directors tasked with creating and revising these protocols. relationship with self-reported patient care practices. and the frequency with which they were performed. to report performing all six acts of suboptimal care. David A. Pearson, MD, et al. was associated with percutaneous coronary intervention (PCI), OHCA survival or neurological outcome. discharge, with cerebral performance category score 1-2 defined as a good neurological outcome. 1.23, p=0.07), or in those with a good versus poor neurological outcome (1.57 vs 1.26, p=0.14). survival or neurological outcome in OHCA patients. Lisa H. Merck, MD, MPH, et al. 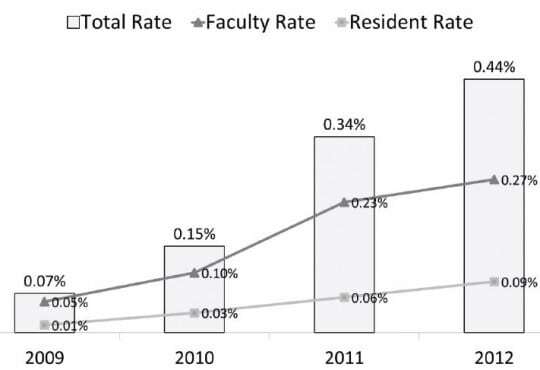 CT utilization in emergency department (ED) patients. Methods: An observational multiphase before-after cohort study was completed from 4/2010-5/2011. propensity score that controlled for potential confounders of CT utilization. no adverse events reported during the study period. 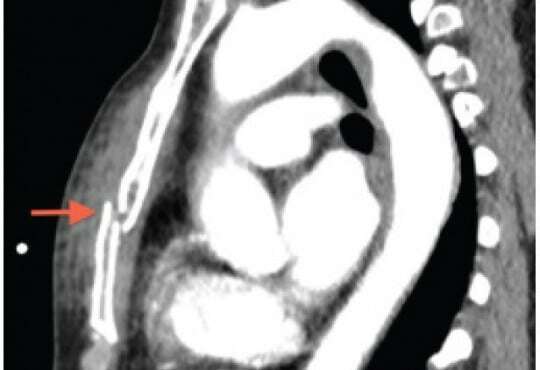 as to reduce the risks and cost associated with CT.
Jesse J. Brennan, MA, et al. all-cause readmissions following a hospital admission. readmissions, 30-day ED discharges, and no 30-day visits. Dylan Carney, MD, et al. diffuse abdominal tenderness without rebound or guarding. diagnosis of nonspecific abdominal pain. Christopher A. Kahn, MD, MPH, et al. crashes were reported as distraction-affected. Of 3,331 people killed in 2011 on roadways in the U.S.
as a result of driver distraction, 385 died in a crash where at least one driver was using a cell phone. administrators, legislators, friends and family. Jill M. Huded, MD, et al. prompt interventions through a geriatric nurse liaison (GNL) model. therapy (PT), social work or home health as determined by the GNL. Conclusion: The ED visit may provide an opportunity for older adults to be screened for fall risk. Bradley D. Gordon, MD, MS, et al. been performed outside of the care environment. interviews were analyzed for emerging qualitative themes. disposition; improved confidence of provider; and changes in decisions for diagnostic imaging. Conclusion: ED providers are driven to use HIE when they’re missing a known piece of information. interpreting lab results, making admission decisions, and prevents repeat diagnostic imaging. Jestin N. Carlson, MD, MSc, et al. third iteration of the National Emergency Airway Registry (NEARIII). through December 31, 2012. All cases where the indication for intubation was “GI bleed” were analyzed. 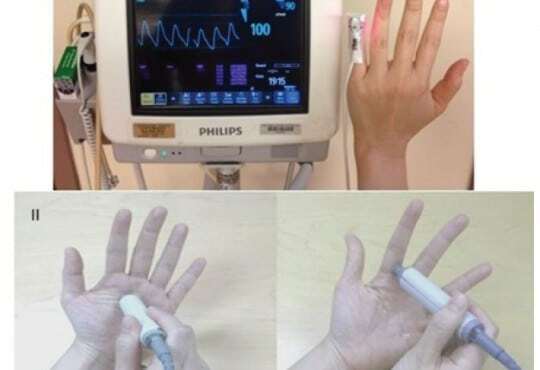 attempts initiated as DL and VL using parametric and non-parametric tests when appropriate. (0.7%) and VL 1/30 (3.3%); p=0.15]. both DL and VL had similar rates of success, glottic views and need to change devices. Shadi Lahham, MD, MS, et al. performed for the chest tenderness. Daniel J. Henning, MD, MPH, et al. 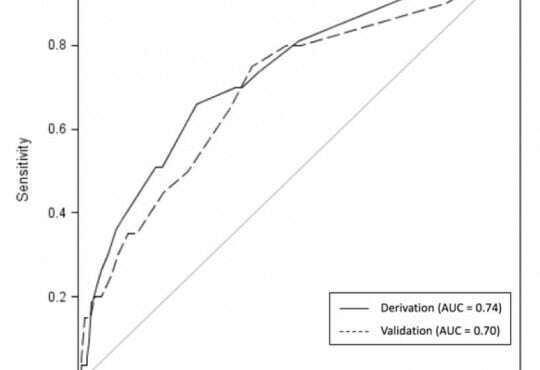 outcomes in ED patients with abnormal vital signs or lactate levels, but who are not in shock. hospitalization were determined using logistic regression. excluded, leaving 532 for analysis. Of these, 53/532 (9.9±2.5%) deteriorated after hospital admission. adverse outcomes with reasonable reliability. Michael J. Ward, MD, MBA, et al. the relationship between ED crowding and time spent at transferring EDs for patients with STEMI. trauma, rural, ED volume) to DIDO. translates into a five-minute increase in DIDO for every one-hour increase in ED LOS for admitted patients. small but operationally insignificant effect on time spent at the transferring ED. Nnaemeka G. Okafor, MD, MS, et al. and implementation of a web-based ED-specific incident reporting system using an iterative process. committee for ED providers to report incidents that they believe could impact patient safety. voluntary, and non-punitive reporting system. Mark E. Sutter, MD, et al. after start of the program. an opioid, the use of opioids was safe. be answered yes, now and into our futures. Volume 16, Issue 5, December 2015. Kory S. London, MD, et al. medicine-based educational PS survey with strong evidence for content validity. questions was selected. Thirty one questions were judged to be relevant from an original 48-question list. Of these, the final 10 questions were chosen. Response rates for individual survey items was 99.5%. be needed to obtain evidence for response process, internal structure and construct validity. Matthew C. DeLaney, MD, et al. 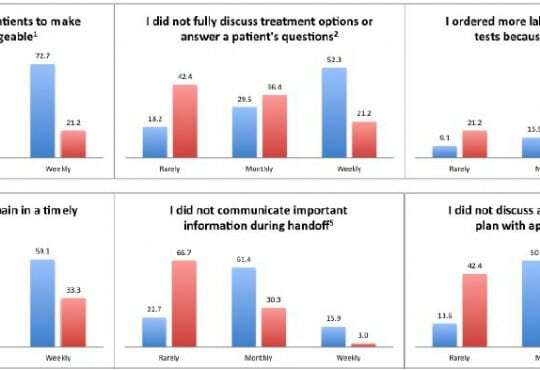 satisfaction with physician and nursing care, pain levels, and understanding of discharge instructions. Methods: We studied a convenience sample of 100 patients treated at an urban academic ED. weighting the estimates to account for the ordinal responses. 0.078). Providers underestimated pain and patient comprehension of discharge instructions. care, pain level, or understanding of discharge instructions. outcomes, patient-specific outcomes, or health system-specific outcomes. significant outcomes, and the cost implications of addressing language barriers. implications of prehospital language barriers. Jarrod M. Mosier, MD, et al. derangements of the patient increase the risk of cardiovascular collapse from airway management. predicted anatomic difficulty of the intubation. 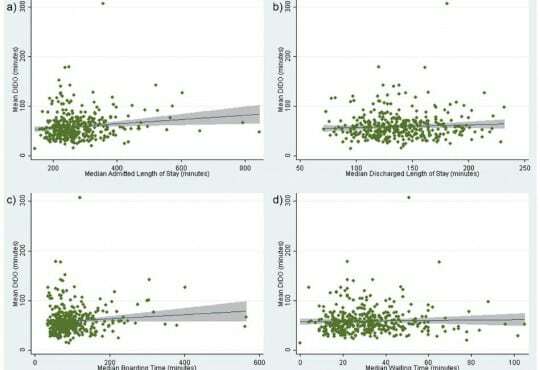 showing that lactate clearance during the ED stay is associated with decreased mortality. had initial lactate levels measured in the ED and upon arrival (<24 hours) to the hospital floor. Lactate clearance was calculated as percent of serum lactate change from ED to floor measurement. 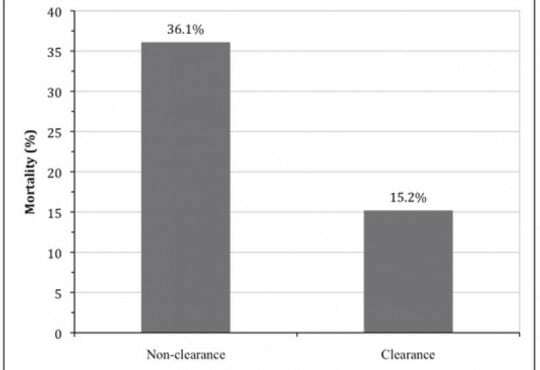 was used in 66.7% of the non-clearance group and 36.3% of the clearance group (p=0.001). Janice N. Thai, MD, et al. or societal consensus guidelines or best practice guidelines exist to our knowledge. direct digital pressure, temporary tourniquet pressure, compressive dressings followed by wound closure. approach is often not needed (with a few exceptions) to achieve hemostasis for most forearm lacerations. efficacy and functional outcome while minimizing the cost of medical care.